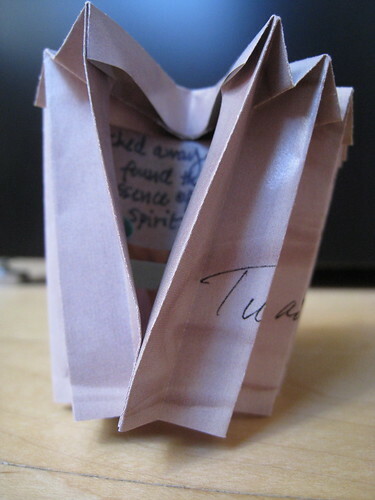 This tiny fort contains several strips of paper in a variety of formats. 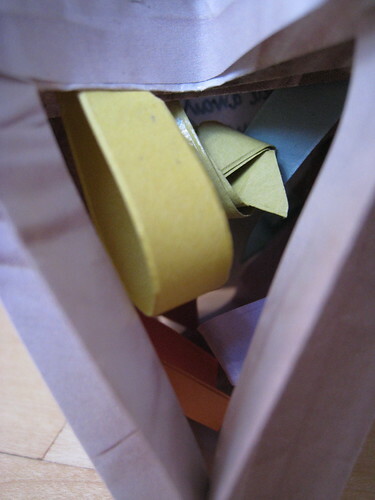 It symbolizes a brief retrospective of my paper projects, beginning back in 1997 with my fortunehearts. Well, I always assumed that my fortunehearts were my first connection with strips of paper. But in fact, I created an open pillow filled with my own written fortunes in 1995. Needless to say, I have used strips of paper as a medium for many, many years now. Over the last fifteen years, I have continued using them up to my tobacco rug project and my smaller paper weavings on Etsy. I always attribute my handiwork as a way to reconnect with my memories of my grandmothers who made so much with their hands. In fact, I am going to guess that neither one ever touched a computer. From Memaw cracking green beans to Grandma Merritt creating clothes, my own take involves my love for paper and its natural ability for sharing everlasting stories despite its ephemeral qualities. I consider each project an evolution of the next. And even with Grandfather’s Chair, another piece from 1995, it ties in perfectly with the Tobacco Rug from thirteen years later. I display them side by side in my studio. I feel quite lucky to have found a strong voice that resonates with me so deeply at such a young age. 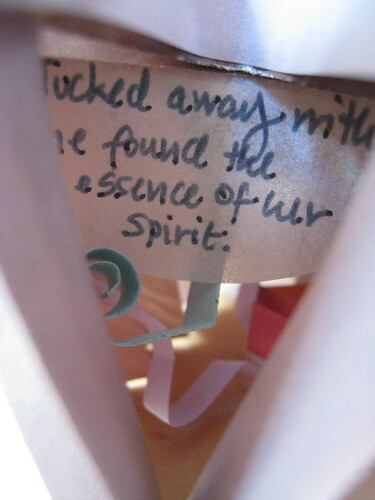 Tucked away within, she found the essence of her spirit. With these last few pieces, I wanted to capture the bigger picture of what this body of work has meant to me. And here I was able to say that each of these tiny folds means so much of who I am. Maybe it started with making flowers out of Juicy Fruit wrappers in church with Memaw. I don’t know. But it wasn’t until I went to Penland in the summer of 2008 that I realized my art reflects my childhood interests, which was my thesis to my graduate work Art and Play. It only took me five years to figure that out, even though I spent four years working on my graduate studies. Sometimes the most obvious things are hidden in plain sight.